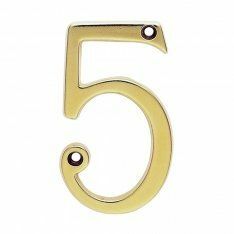 To give your home a bit of identity, we supply a wide selection of door numerals and letters in several fonts and finishes, including polished brass letters, satin stainless steel letters, pewter door numerals and more. To embellish your entrance door even further, we would recommend browsing through our selection of entrance door ironmongery, such as letter plates and letter tidies which are not only practical but can be stylish. Centre door knobs can be seen as a decorative piece for your front door as well. Similar to euro cylinder pulls, centre door knobs are used to pull the door closed from the outside, however, our door knobs will give a unique flair to any entrance door with their various designs and styles. For example, we stock period art deco door knobs, octagonal centre door knobs and round centre door knobs. Additionally, we store a large collection of traditional and modern door knockers, including the brass lion’s head door knocker, which is one of our most popular door knockers. The lion’s head door knocker is known for representing protection, bravery and strength. At Ironmongery Experts we also stock a variety of door locks to increase your property’s overall security, including sash locks which incorporate both a deadbolt and a latch, as well as mortice deadlocks and rim latches that can be used as secondary security methods, alongside with door chains.